The HZ Slow Juicer is the new flagship juice extractor from Hurom equipped with the best and latest technology. It features improved juice extraction efficiency, easier cleaning and the ability to make ice cream, thanks to its 43 RPM motor. All Hurom cold press juicers are pleasing to the eye but Hurom HZ really caught my attention. Its sleek stainless steel finish along with the LED indicator make it really stand out. The LED indicates the status of the machine whether it’s on or off, if it’s in extraction mode, or in reverse mode. Sadly you still have to use the manual button to operate the machine. Apart from its looks you’ll have a peace of mind with its BPA-free, impact resistant ABS plastic body. In addition, the strainer and auger are also made of heavy duty Ultem plastic. This machine can help you prepare a freshly pressed juice for a decade with its 10-year warranty. An upright masticating juicer is the easiest juicing machine to use, it’s self-feeding, it’s not heavy, you can move it around with ease and best of all it’s equipped with self-cleaning system. 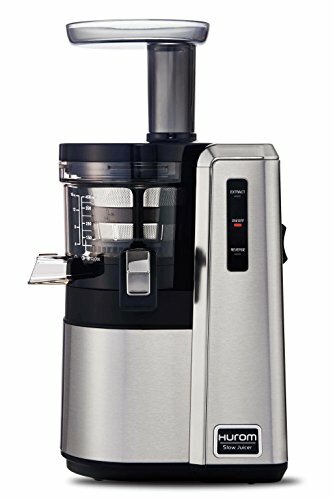 With a regular juicer (without a self-cleaning system) you’ll have to constantly disassemble, rinse and put your juicer back again when juicing different juice recipes. Without cleaning the juicing chamber and the auger, the taste of your next juice might get compromised. This problem is solved with a self-cleaning system. You just need to let the machine run while pouring water in the chute until the residue is gone. No more hassles on juicing your next recipe. How convenient is that? Hurom HZ’s complimentary accessories justify the high price point. If you want to add pulp to your juice you can use the coarse strainer, it’s also ideal for juicing soft fruits. Most of the time you’ll be good with the fine strainer if you don’t want pulp in your juice. If you’re craving for something sweet you can make ice cream with your ice cream strainer, a healthy ice cream preferably. The only disadvantage of slow juicers is you’ll have to chop your produce into small pieces but the quality of the juice is worth the time and effort. This machine is not dishwasher safe but it should take you more or less 5 minutes to clean it. Hurom HZ does not always need to be taken apart between uses. It’s equipped with a self-cleaning system, simply close the juice tap, fill with water, and turn it on. The spinning brush whisks away any pulp that has become caught in the strainer. Allow it to drain, and repeat until it is free of any remaining pulp or residue. When you are ready to pull it apart for a good scrub, a large and small cleaning brush have been included for your convenience. A drying rack has also been included. If you’re not satisfied, put all the removable parts in warm, soapy water (except the base). Use the stiff brushes to scrub pulp from the strainers. Take the stiff cleaning brush and scrub the juicing screen to remove any remaining pulp. Ensure all of the pulp has been removed from the strainer. The Alpha technology developed by Hurom allows the user to extract fresh, natural tasting juice. The quality is full-bodied and flavorful. It produces the highest possible yield by methodically pressing the produce, and expelling bone dry pulp as it juices. With an auger speed of only 43 RPM and the spinning brush speed at only 17 RPM, the juice is gently mixed within the drum. It results in less froth and a better overall taste. In addition to a decadent taste, the juice is packed with nutrients, antioxidants, and vitamins. Plus, the lever allows you to control over the amount of pulp you allow in your juice. You can choose to have juice with pulp in it or go pulp-free-it’s all in your hands. You can easily create large batches that can be stored for consumption at a later time. This juice press can process all types of produce-soft & hard produce, citrus fruits, leafy greens, and some beans and nuts. Hard produce includes turmeric, asparagus, yakon, garlic, broccoli, ginger, carrots, celery, pumpkin, beets, pear, bitter gourd, pepper, apple, fennel, cilantro, cucumber, cauliflower, watermelon, pineapple, and sweet potato. Using the coarse Ultem strainer you can make a puree out of cranberries, avocado, pomegranate, peach, kiwifruit, grapes, melon, mango, strawberry, papaya, tomato, and blackberry. Leafy greens include lettuce, spring onion, wheatgrass, pine tree needles, dandelion greens, basil, kale, cabbage, beet greens, spinach, peppermint, collard greens, parsley, brussels sprout, and moringa. You can also make soy and almond milk, tofu, and ice cream with this machine. The Hurom HZ Slow Juicer is a great intermediate level juicer. If you feel the need to upgrade from your entry level centrifugal juicer or your old masticating juicer, this machine should be on top of your list.